Nate: That’s a cool quilt. N: Those colors are kind of fall-y! 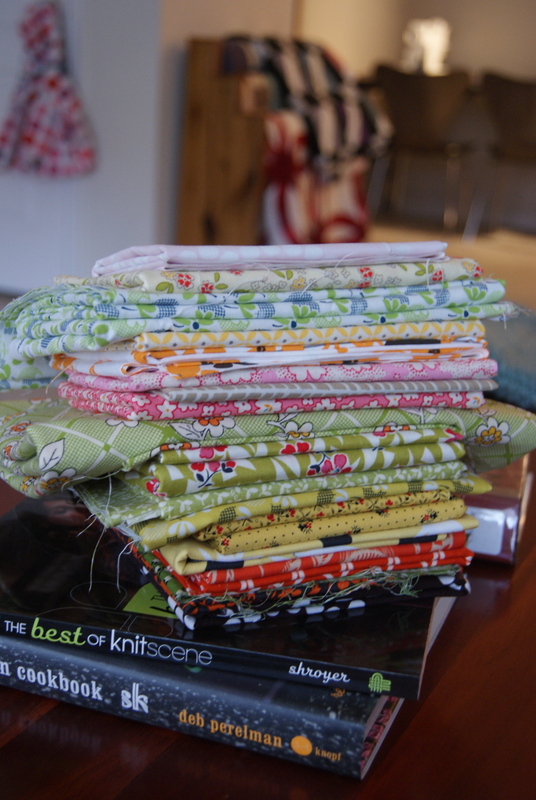 L: that’s because I picked out the fabric in October, started the quilt in November, and I’m just now finishing it. 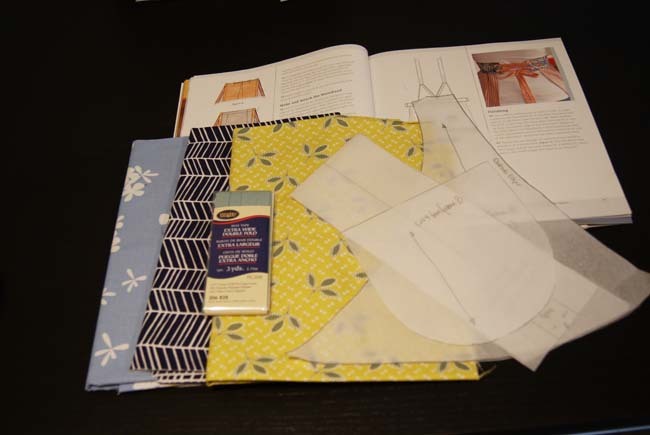 When Rachel @ Stitched in Color, Amy @ Badskirt, etc started their Value Added QAL last fall, I was so buried in Christmas gifts that I knew it was a horrible idea to take something else on. 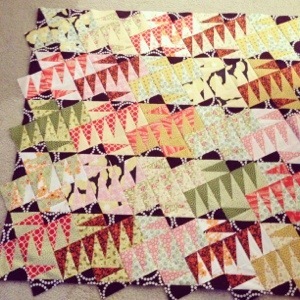 Then Amy started posting details about her fantastic Bargain Basement quilt pattern…and the pattern was just too genius. I couldn’t help myself. 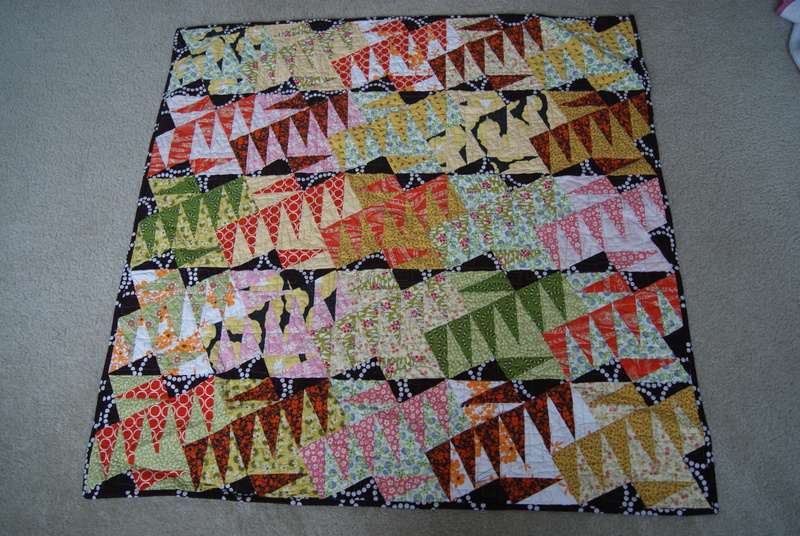 After I compulsively pieced the first four blocks, I had visions of queen-size dancing in my head. 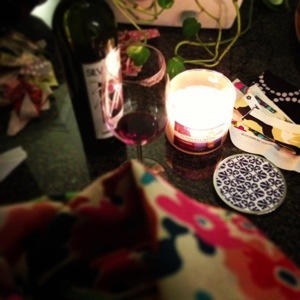 (Also I was Christmas-crafting-delusional at the time.) Then I back-burnered the project, and it got slow. And guilt-ridden. I’m looking at these lovely fall colors, thinking, why isn’t this done? 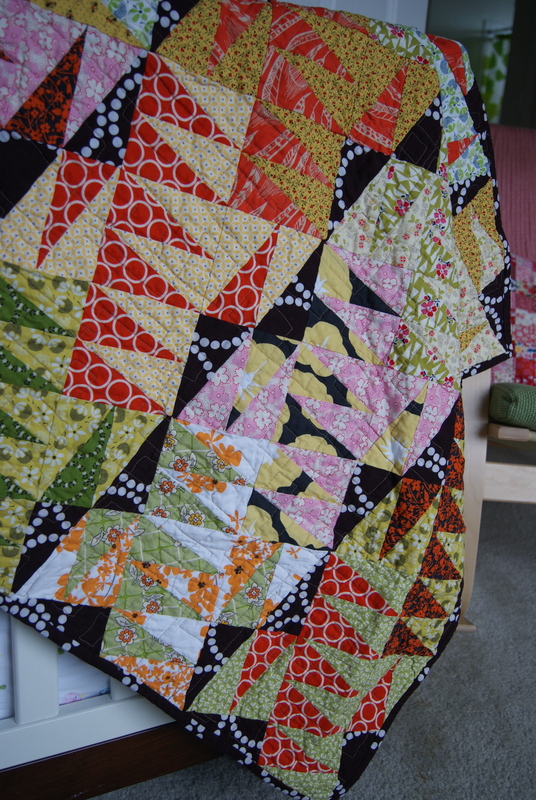 And I’d sew all day, piecing blocks, and I’d be like, why isn’t this quilt getting bigger? And then I got super-sick and didn’t sew at all, and this was the guilt project I was obsessively not-sewing while I was couch-surfing. 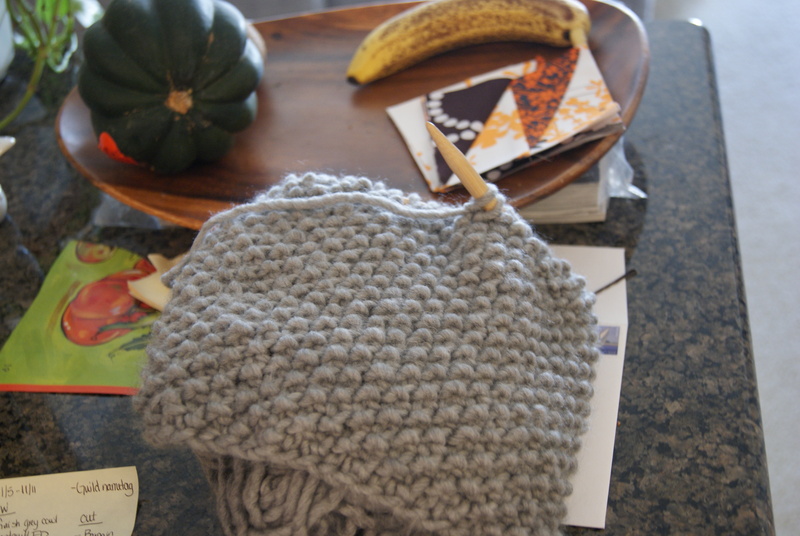 And THEN I ran plumb out of fabric. 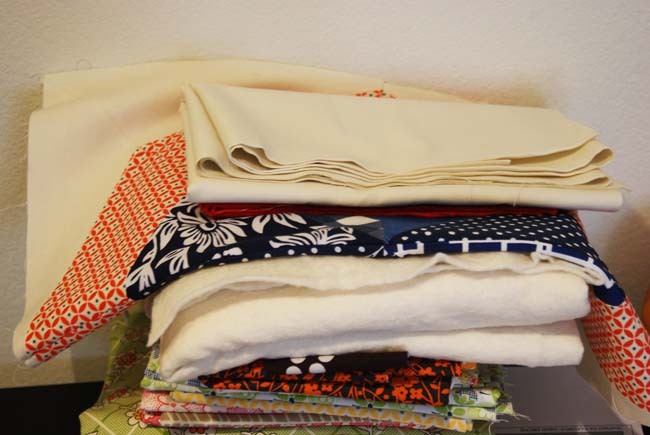 Paper piecing uses a lot more fabric than I’m used to! So this is really a very little quilt. The triangles are 2” wide and 4” tall. The whole quilt is like, 45” x 45”. It’s just this side of big enough for a throw quilt. Lucy is crazy about this little quilt. It’s small enough for her to drag around, plus she’s currently nuts about 1) flowers and 2) the alphabet. 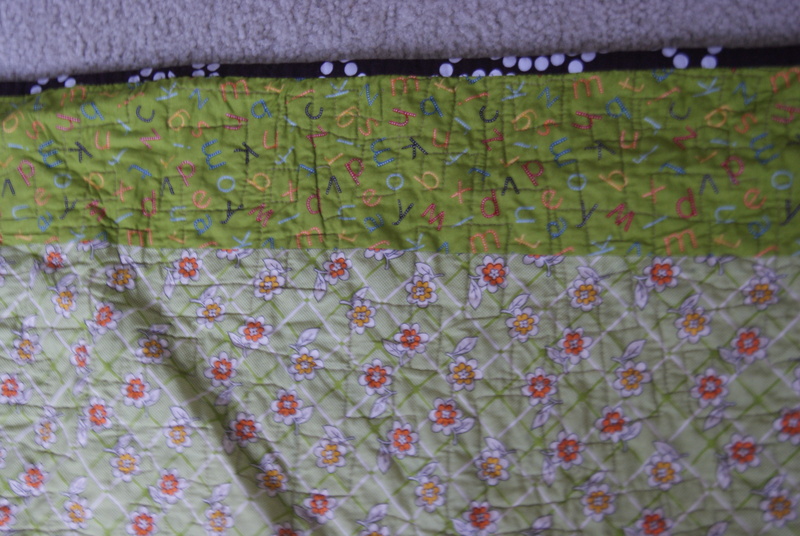 So when she sees the quilt, she’s likely to either sniff-sniff the printed flowers and say, “good” (for “smells good”), or start belting the alphabet song. The backing prints are from Punctuation by American Jane for Moda. 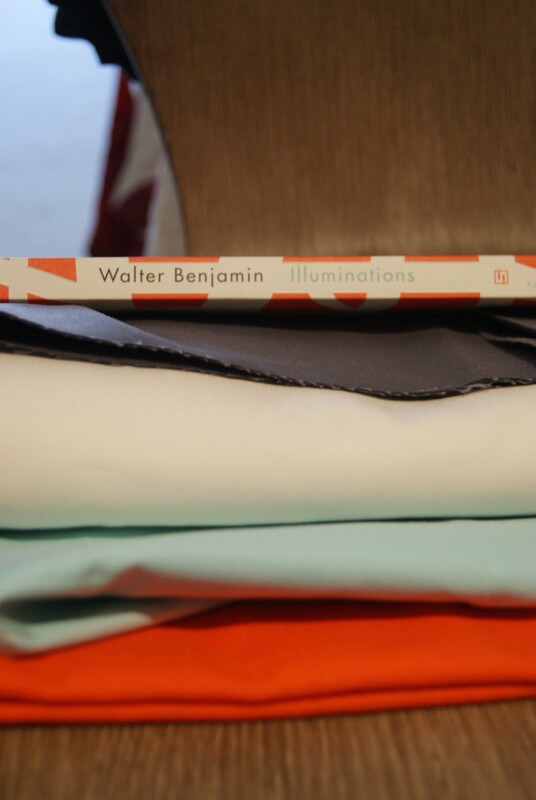 I actually bought them to make Lucy’s crib sheets (and thenshecameonherduedate and I ranoutofcraftingtime). 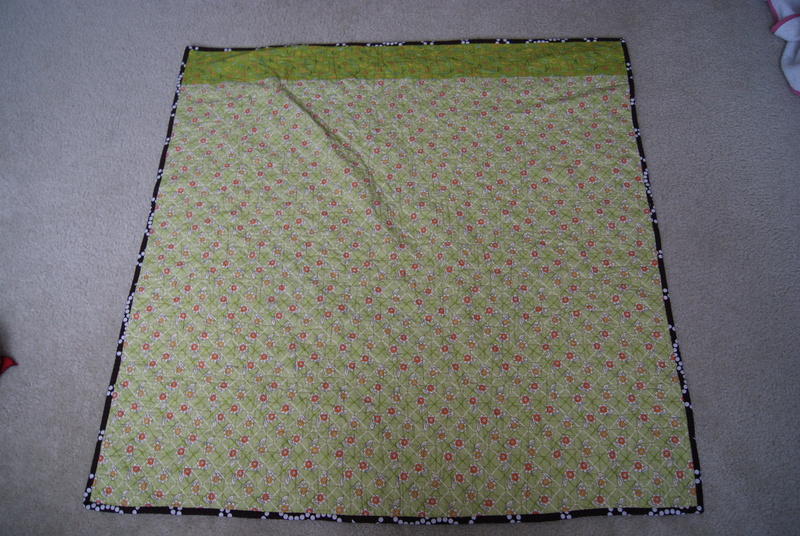 Finally, this is not only the first quilt I paper-pieced, it is the first entire quilt I FMQ’ed. I used a wonky-boxes pattern, and I love it on this piecing. 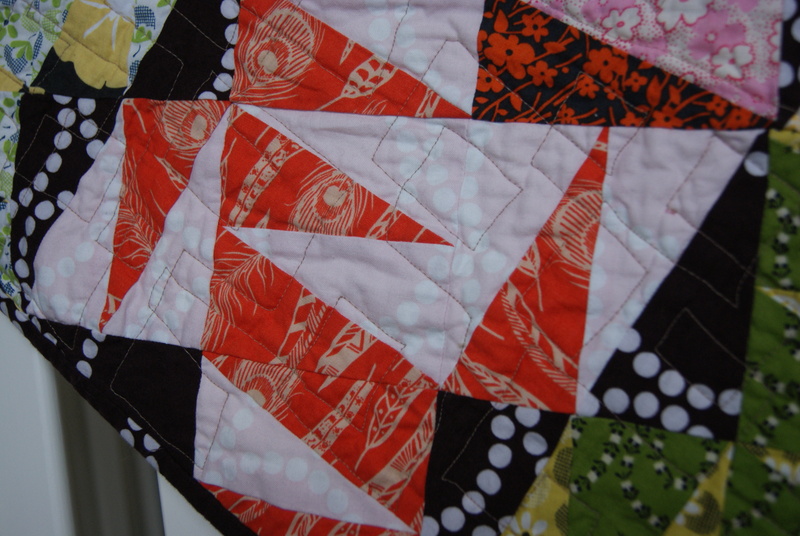 Here’s a closeup of my big piecing mistake, do you see it?! I’m super-proud of this little one. It was a challenge, I learned two new things while I did it (and I really think I got better about seeing “value” in prints–it worked). And the result is pretty cute! desperately trying to finish Friday? I’m sure I’m not the only one who rushes around like a crazy on Fridays, trying desperately to finish something for Finish it Up Friday. Failed again! See those little doodads on three of the sides? I gotta date with my seam ripper after Lu goes to bed. It’s all going to work out though, and I am SO RELIEVED to have gotten this thing this far today. Lucy says it is “so pretty,” “orange,” and “triangles.” Yep, that it is, kid. More on this one very. soon. We’re back in the frigid north. We are also all sick. So, an Instagrammed view-from-my-face for you, patient reader. A glorified test pattern of sorts. Maybe it’s Christmas crafting doing this to me. Or what exactly needs to get done first. If you’re still reading (I’m not), thanks, and, I hope I have a more gathered-together post with some actual progress to show in a few days!